The latest antisemitic missive from Muslim Rep. Ilhan Omar (D-Minn.) sparked heavy criticism from many, including Chelsea Clinton. Update: Please see an update to this story here. 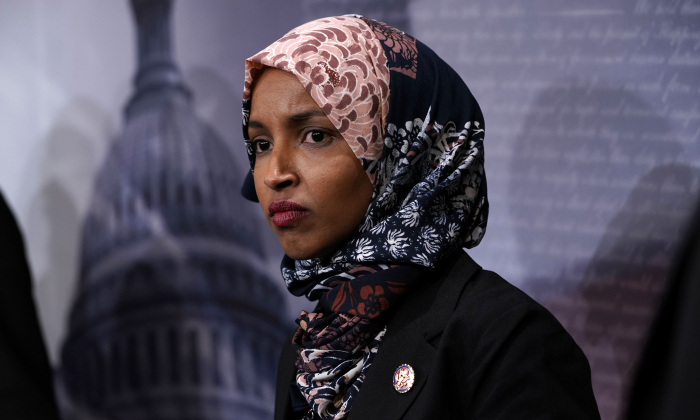 Omar has a history of antisemitic views that have drawn widespread condemnation just weeks after taking office in January. Omar has refused to apologize for the message and instead has repeatedly attacked Israel in recent interviews and statements while largely ignoring the plight of Muslim women across much of the Middle East. “Bad form, Congresswoman. That’s the second anti-Semitic trope you’ve tweeted,” she added. Instead of apologizing, Omar again doubled down, saying, “AIPAC!” referring to the American Israel Public Affairs Committee. Omar was roundly criticized for her comments, with AIPAC among those responding. A number of lawmakers and public figures also condemned Omar’s attacks, including Chelsea Clinton, daughter of former President Bill Clinton and former Secretary of State Hillary Clinton. Shapiro said that some held off on criticizing Omar because they wanted to work with her. “But these efforts have failed. Her support for BDS is apparently her essence: blaming Israel alone for the conflict, absolving Palestinians of all responsibility, delegitimizing Israel’s very existence, &accusing its supporters of shallow motives &manipulation by Jewish money,” he said. While Democrat leadership has remained quiet about the growing antisemitism in the party, two House Democrats, Reps. Josh Gottheimer (N.J.) and Elaine Luria (Va.) are collecting signatures for a letter to send to party leaders expressing deep concern over “recent rhetoric from certain members within our Caucus, including just last night, that has disparaged us and called into question our loyalty to our nation,” reported Politico. “We must speak out when any Member—Democrat or Republican—uses harmful tropes and stereotypes, levels accusations of dual loyalty, or makes reckless statements like those yesterday,” the representatives wrote.